It is an input component with a color palette. It allows us to select and reselect color in web application. 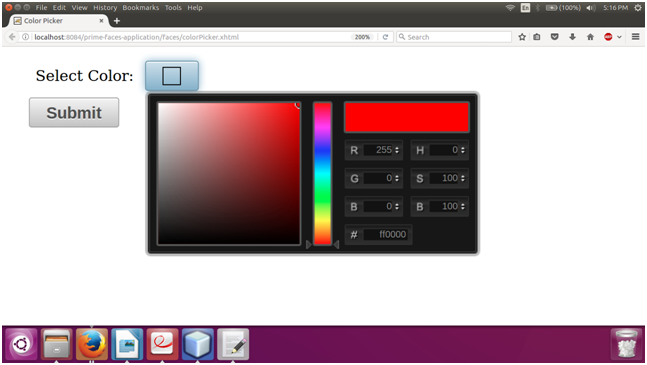 We can use it in our JSF application to get color as user input. PrimeFaces provides <p:colorPicker> component to create ColorPicker in the web application. It has various attributes that are tabled below. required false Boolean It is used to mark component as required. valueChangeListener null ValueChangeListener It is a method binding expression that refers to a method for handling a valuchangeevent. requiredMessage null String It is used to set message to be displayed when required field validation fails. validatorMessage null String It is used to set message to be displayed when validation fields. 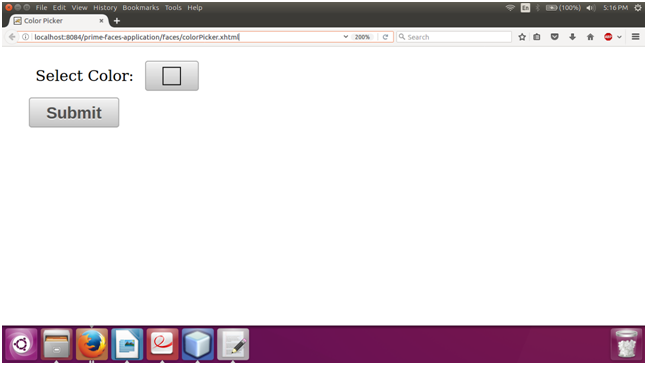 mode popup String It is used to set display mode. style null String It is used to set inline CSS style of the component. Following are the structural style classes that are applicable on the ColorPicker. Here, in the following example, we are implementing <p:colorPicker> component. This example contains the following files.